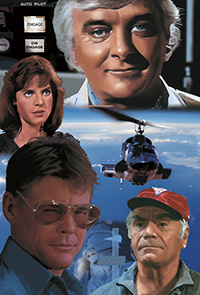 Dr ﻿Moffet is seen here hovering over the earth as his ghostly presence is felt throughout the creepy Tom Cook-penned episode even though Hawke despatched him to hell the year before. The Airwolf shot here is an actual real image as opposed to the model used for the composite matte shot in the actual episode; easily spotted because of the lack of any detail on the r/c model. I felt the detail was required for the Lady to work in context at 80,000ft. I made it more dominant as part of the Earth shot than it was in the original episode since I was going to allow the detail to show. I also made the Earth central to the painting as it’s such an iconic image of Airwolf hovering up in the stratosphere after their rollercoaster ride away from the USAF jets. Note the digital read-out of the ceiling reference at the bottom with the faded image of the frozen Hawke after activating the "Purge' control" to freeze Moffet out! I’ve learned from these paintings that less can be definitely more. In an earlier version of this painting from 2007 I had Archangel & Marella in the painting too but the core relationship between Dr Hansen, Hawke and Dom is what makes this episode work. Moffet was actually on a computer screen in the episode but sadly images from that day shoot with the late actor, David Hemmings didn’t exist so it was a hard job to undistort Moffet for the final image. Dom's engineering console's Engage / Disengage buttons had to go in as well, central to the “logic bomb” plot-line and the visual for memorable and spooky synthesized ‘ghost’ sound (Mark informed me it was from a Roland Jupiter 8) as technology was central to the episode with the implication that Airwolf was more than just an aircraft but also a very sophisticated, state-of-the-art computer system capable of independent action through its programming.